It's Official - Finally, a Digital Camera for us Old Pharts! January 28, 2014 Geren W. Mortensen, Jr.
Much has happened since I posted TOM, THE FUJIFILM X-E1, AND A DOLLAR BILL back in September. Fujifilm updated the X-E1 to the X-E2, and they introduced the X-M1 and the X-A1. And, at around 11:30PM EDT last night, Fujifilm announced what looks to be a delightful digital camera for those of us who have long lamented the disappearance of traditional camera controls: shutter speed dials, aperture rings, etc. It's called the Fujifilm X-T1. This is the second camera to hit the market with this level of control (the first being Nikon's full-frame Df), and the first mirrorless APS-C camera do so. The X-T1 features the traditional aesthetic of an SLR married to all the tech that only Fujifilm brings to the table with their advanced X-Trans II sensor and EXR-II image processor. The image above clearly shows the traditional control layout. Finally, everything is where it should be on a digital "SLR" styled camera -- the shutter speed dial adjacent the viewfinder hump, aperture ring around the lens, shutter button under the forefinger, along with easily accessed ISO and exposure compensation dials. Still, the camera is compact, possibly about the same size as the old Olympus SLRs. As exciting as the X-Pro I and the XE-2 are, this camera looks to be as close to photographic nirvana as an old phart like me could get. I'll be anxious to see the price! December 6, 2013 Geren W. Mortensen, Jr. Since most people are shooting APS-C DSLR cameras these days, I figure this would be the place to start. For these cameras with a "crop factor" of about 1.5x, we need to cover the range from about 16mm-90mm to get lenses with an equivalent angle-of-view to my three-lens setup. 16mm wide-angle: There's really only one non-fisheye 16mm lenses out there, and it's a manual-focus Samyang SY16M-C 16mm f/2.0 (it's also available as a Rokinon- or Bower-branded lens, but in each case, they're manufactured by Samyang), which sells for about $479.00. In addition to most regular DSLR mounts, this lens is also available for Sony's NEX mirrorless cameras, as well as Fujifilm X-mount cameras. Most of the reviews I've read of Samyang lenses are pretty good. The only big caveat that I can see is that on most cameras, focusing may be difficult. This is not really a fault of the lens, but rather, because most DSLR and mirrorless camera systems are severely lacking when it comes to manual focusing aids. It should also be noted that this is a large, heavy lens at almost 4" long and weighing about 20oz. 90mm telephoto: The only actual 90mm prime lens that I've been able to find is the Tamron AF 90mm f/2.8, which is available for most DSLRs. It's an incredibly sharp lens, and is quite versatile -- it can be used as a general telephoto lens, a true 1:1 macro, and it's a great lens for portraiture as well, and this versatility makes the $500 price tag a little easier to cope with. However, because the macro lens is designed to focus very accurately at close range, the gearing of the focusing mechanism is such that autofocus can be fairly slow when used for non-macro photography. Depending on your use, that may not matter at all, and the versatility of the lens may outweigh the slow focusing. If you need faster focus, and don't mind giving up a little bit of "reach" from the telephoto and close focusing capability, there are a number of excellent 85mm lenses available at very attractive prices -- or much higher prices, depending on the model. 85mm f/1.8 lenses make excellent portrait lenses. There aren't many zoom lenses for APS-C DSLRs that cover the range we're looking for. If you're a Canon shooter, there is the Tokina 16.5-135mm f/3.5-5.6 AF DX II, available for about $250. As near as I can tell, it's a discontinued lens, and it was never all that great. It's also a slow lens, which means that getting nice, soft backgrounds for portraits may be an issue, depending on the shooting conditions. Choices for Micro Four-Thirds 3-lens kits are a bit more limited, but the available lenses are all excellent and compact. Unfortunately, they're also expensive. An advantage to the micro four-thirds format is that one lens fits both "DLSR-style" and "rangefinder-style" bodies, so if you want a "big rig" and a "stealth rig", you don't have to buy a complete set of lenses for both. In the micro four-thirds format with it's 2x "crop factor," the focal length range is from 12mm to 67.5mm. There are generally two manufactures of micro four-thirds lenses: Olympus and Panasonic, and lenses from both manufacturers are of excellent optical quality. Olympus and Panasonic happen to also be the only current manufacturers of micro four-thirds cameras, and there's one major difference between the two -- Olympus uses in-camera image stabilization, and Panasonic handles stabilization in the lens. Let's move on to our lens selections. 12mm wide-angle: As I mentioned, options here are limited. For a 12mm lens, the only option is the $800 Olympus 12mm f/2.0 at nearly $800. Image quality from the lens is stellar, and the construction is top-notch. As it's an Olympus lens, there's no image stabilization in the lens. Switching from auto-focus to manual focus is as easy as sliding the focus ring in or out. At f/2.0, it's a fairly fast lens, and it's a great one for photographing the "grand landscape" or for street photography in tight quarters. 25mm normal: Olympus doesn't have a 25mm lens, so for the normal lens, the option is Panasonic's Lumix G Micro 4/3 LEICA DG SUMMILUX 25mm f/1.4, which will set you back about $530. While there's no image stabilization in this lens, the fast f/1.4 aperture features seven curved blades for exceptionally smooth bokeh and nice, creamy-soft backgrounds when used under the right conditions. There are also special optical coatings to all but eliminate flare and other optical aberrations. 67.5mm telephoto: The closest thing currently available to a 135mm-equivalent lens would be the Olympus 75mm f1.8, which works out to a 150mm equivalent. This is a pricey lens, too, at $900, but it's really the only prime lens in its class for micro four-thirds cameras. You'll notice that I haven't suggested any zoom lenses, and there are reasons. Zoom lenses that cover a range from very-wide-angle-to-medium-telephoto are always compromises in at least one area. Almost always, they're slow, and that all but eliminates the chances of getting good control of depth of field. Also, they tend to not be as crisp as prime lenses at the extreme ends of their zoom ranges. In micro four-thirds, where the sensor chip is even smaller than APS-C, you need every bit of depth-of-field control and sharpness you can get. However, the point is moot, as there are no micro four-thirds lenses available that cover the range we're looking for. You'll notice that I made very little mention of the Fujifilm X-series in this discussion, and that's because while there are some great lenses available for the Fujifilm cameras, it's quite difficult to match up to the focal lengths I was looking for. It is possible to mount various lenses to the Fujis via adapters, and some folks are being very successful doing this, but I was really wanting to use lenses that, for the most part, just fit. As it is, there is an excellent 14mm F2.8 and 35mm F1.4 to cover the wide-angle and normal ranges. However, there really aren't any medium telephoto primes out there for the Fujis yet. I'm sure that will be rectified in the relatively near future. The zoom lenses that Fuji have made so far are excellent and relatively fast, too. So far, there's a 18-55mm f/2.8-4 that's available with the X-E2 kit, and a Fujifilm XF 55-200mm F3.5-4.8 that I'm told is extremely impressive. I could definitely see the combo as a nice, two-lens system for a quite decent price. Somehow, the magic within the Fujifilm boxes delivers unexpected depth of field, given the APS-C sensor size. So, there you have it. My off-the-cuff attempt at finding a way to replicate my favorite kit from 1979 using today's gear. It's obviously an expensive proposition and there are a number of compromises involved, but it could be done. Sorry, Folks. Film is Dead. November 26, 2013 Geren W. Mortensen, Jr.
Kodak has stopped production of all consumer films, and also of all slide films. That means that only a couple their professional C-41 print films and a couple of black-and-white films are still in production. Fuji has dropped all of their film with the exception of but three consumer C-41 print films, and have dropped their professional black-and-white instant film and several of their professional color print films. Agfa is gone from the film market altogether. Ilford ain't doin' so great. So, what brought this up? A couple of recent conversations. Saturday, we were talking to travel photographer David Maynard. David had just recently shot his last roll of Kodak Gold, and he was in a bit of a panic about what he was going to do. He'd worked long and hard to perfect his film-based workflow, and everything was tuned around that film. He's tried Fuji's films, and doesn't like the color. The same goes for Kodak's Portra films. Maybe Ektar will be his new film? Even so, he's looking at a serious disruption in his work. Last night, Donna and I were talking some more about film. No, I don't remember what brought it up, but she commented that she'd like to run a roll of film through an old Agfa camera that's been in her family for years -- and has gone halfway around the world! 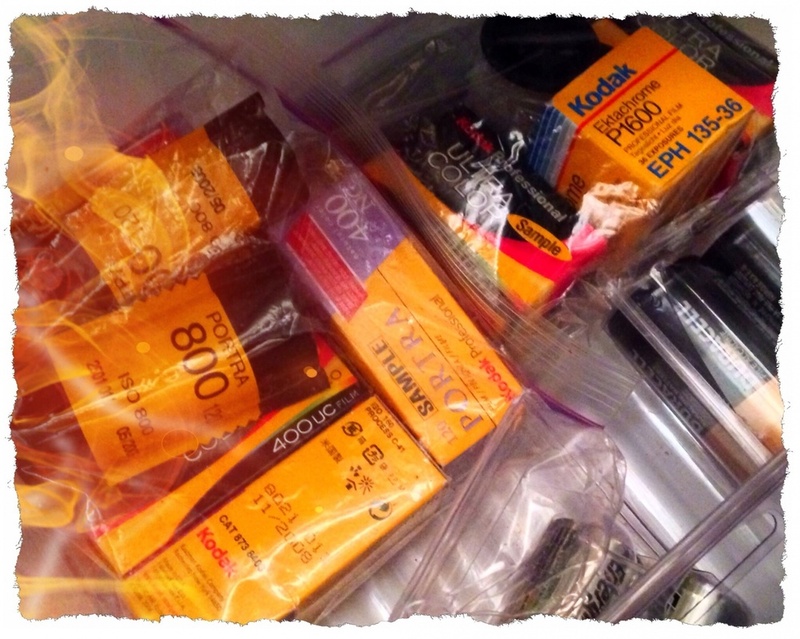 She's got a sentimental reason to want to run that roll of film. She also wants to shoot an entire project on film, for the experience of learning to expose manually -- without the crutch of being able to peek at the back of the camera to see what she's got, along with the limitation on the number of available exposures. She also wants to experience the very tactile controls of an analog camera. Interestingly, this who topic has been coming up on numerous blogs and podcasts lately. In an all digital world, with most cameras having somewhat disconnected soft-touch controls, how does one go about achieving a more film-like experience? If all that your film-fix requires is to emulate a more recent film SLR, you can simply set the display on the back of your DLSR to it's info-only display, or turn it off altogether, or stick a piece of gaffer's tape over it, and then stick in a really small flash card and shoot the best quality JPEG file your camera can make. Most recent film SLRs did away with with aperture rings and dedicated shutter speed controls anyway, so using a DSLR in this manner isn't really all that different from a "modern" film camera, and shooting JPEGs is kinda like shooting slide film. If you want full-on, analog-style, manual controls on a digital camera, your choices right now are limited and relatively expensive: Fujifilm's X-Pro1 or the new Nikon Df. I've written little bits about each of these cameras before. Fuji's X-E1 and new X-E2 come really close, with all the traditional controls, but a beautiful electronic viewfinder. Of course, images made on film look different than digital images. It's kind of like early audio CDs (and digital recording) compared to vinyl records. Film images, even digitized ones, have a more organic look. The Fuji cameras have the option to emulate three popular Fuji film emulsions: Provia, Velvia and Astia, along with black and white. To achieve that look with other digital cameras, you'll need software plugins or presets for your editing software. Getting back to David's plight (remember David? ); he's a dedicated Olympus shooter, so he ought to go out and get himself an OM-D EM-5 body and a couple of lenses. There are parts of the camera that look just like they came from an old OM-4. Then, get a copy of the VSCO film emulator that includes the Kodak films he likes. Yes, it's a new workflow, but I'd bet that, after a little learning curve, he'd like it result just fine. Despite my couple of minor complaints about the X-E1 and X-E2, if I had the money, I'd go over to Service Photo and buy one tomorrow. I'd get my nice film looks, and my nice analog controls in a trim and attractive package (I actually don't mind a good electronic viewfinder). Yes, I know I said that I really liked the OM-D EM-5 (and I do), but after having had the Fuji in my hands again, I know it will be the better camera for me and the way I want to work.